Bulletins, flyers and emails regarding staff developmental workshops offered Ryerson staff. File contains two portraits of men wearing suits, presumably Kodak employees. Editing marks are inscribed. File contains two images of a baseball tournament featuring a Kodak team. One image shows a man wearing a Kodak t-shirt holding a trophy with a baseball. File features three identical prints of women seated at machines labeled 'CINE PROCESS", working to process 35 mm film at the Toronto Film Processing Department. Item is a transparency featuring an image of a woman packing boxes of Ektacolor film into cardboard boxes labelled "Kodak / Toronto" to be shipped to retailers. Item is a copy print that is accompanied by the following description: "Workers in the early 1900s assembling the Number 4A Folding Kodak camera, considered to be the ancestor of all modern folding roll cameras." File contains 2 prints featuring an image of Mr. R. L. Christie, taken for Kodakery for 25 years of service (June 24, 1935 to June 1960). File contains prints and contact sheets featuring images from Kodakery of Jack Hodgson's anniversary party for 25 years of service. File contains contact sheets featuring portraits of J. ME. E. McDonell, Industrial relations taken Thurs Aug 8, 1968 at 10:30 am. File contains contact sheets featuring Kodakery portraits of Alex McPhail, Paper Finishing, 25th anniversary. An online survey printout for an evaluation of employee opinions of leadership qualities and priorities of HR's next Assistant Vice President. File contains photographs featuring images of Kodak warehouses and employees. File contains vacancy/job postings from Human Resources department and was closed as of December 2012. Please see RG 94.46 for future job postings. Series consists of vacancy / job postings and personnel papers of two student residences, Palin Hall (later Oakham House) and Bond House (later O'Keefe House). Item is a transparency featuring an image of a woman packing boxes of Ektacolor film into cardboard boxes labeled "Kodak / Toronto" to be shipped to retailers. Item features an image of women seated at machines labeled 'CINE PROCESS", working to process 35 mm film at the Toronto Film Processing Department. File contains transparencies featuring images of two male Kodak employees moving bars of silver nitrate from a forklift into a metal drum at building 14. File contains transparencies featuring images of Kodak employees applying Workplace Hazardous Materials Information System (WHMIS) labels on Kodak chemicals at the Distribution Centre [building 11] warehouse. File contains transparencies featuring images of a Kodak employee demonstrating the re-use of plastic camera pieces at gelatin blending building 6. Item is a glass-covered 35mm slide with silver paper surrounding image. Red tape holds the edges of the glass. Image depicts a man in goggles working at a piece of machinery in a factory setting. Small sticker Recto top right reads "17." RCM MGM report in Mtl. File contains two group portraits of Kodak employees at the Montreal Office. Item is a photograph from the Purchasing Department Open House. Location - B-7 Purchasing Dept. File contains photographs featuring images of the production of the publication INFocus. File contains photographs featuring portraits of Kodak employees. Subjects include: L. R. Wales, J. E. Riggs, and 2 unknown men. File contains photographs featuring various images of Kodak Canada Inc. 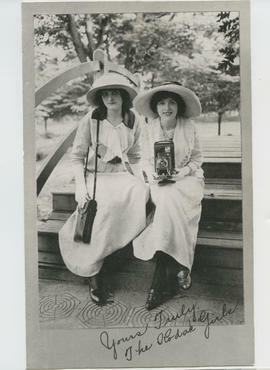 File contains professional portraits, copy prints of George Eastman, advertisements, and portraits of the Kodak Girls throughout the 20th century. File contains four prints of a composite group portrait taken at the GTA Mayors Meeting held at the Kodak Canada Inc. auditorium. File includes images of Kodak staff members taking part in meetings. File contains images of various Kodak employees at various Kodak buildings and events. File contains miscellaneous prints featuring images of employees, buildings, equipment, etc. File consists of a variety of prints and contact sheets featuring images of employees, travel, sports, etc. File consists of photographs featuring images of judges reviewing entries for the Kodak-sponsored "Run for the Money" contest. Item is a photograph featuring an image of a couple standing at the end of a dining room table filled with Christmas food toasting wine. File contains photographs featuring images of Kodak Canada employees in multiple across Canada. Item consists of a contact sheet featuring images of three men holding a Clinical products award from the Ontario Society of Clinical Chemists. File consists of 1 contact sheet featuring images of employees on a stage at Kodak Heights Building #9 (Image Centre) for the Customer Equipment Service training program group picture. File contains photographs featuring images of Kodak employees on the fourth floor of building 14 looking at the coating control room monitor. File consists of 5 prints featuring images of two male Kodak employees moving bars of silver nitrate from a forklift into a metal drum at building 14. File contains photographs featuring images of Kodak employees applying Workplace Hazardous Materials Information System (WHMIS) labels on Kodak chemicals at the Distribution Centre [building 11] warehouse. File consists of two colour photographic prints of a group shot taken on the occasion of Bob Irving's retirement from Kodak Canada on April 17, 1975. File includes legend to individuals depicted. File consists of colour photographic prints documenting Kodak employee Oscar [? ]'s retirement from Kodak Canada Inc. in 1987. File includes lablels to accompany photographs. Item is an album of black-and-white photographic prints representing the Ninth Annual Comptrollers' Conference, held at Kodak Heights in Toronto, Ontario from September 23 - 25, 1953. Item consists of a group portrait of workers on the railway line. A blue "X" inked over one of the heads of the workers probably refers to Mr. Mahan, whose name is handwritten on the verso. Contains mounted colour photographs of Canadian Kodak Company employees at various company events, field trips, and celebrations such as holiday parties, bridal & baby showers, birthdays, departures, retirements etc. File contains job postings sent by the Human Resources department. File closed as of December 2012. Please see RG 94.46 for future job postings. File contains programs from 1946 to 1953 for the Kodak Department Managers' Club spring meeting, held annually in the employee building (building #9) of Kodak Heights. File contains posters announcing wage dividends to be paid out to eligible Kodak employees from 1947 to 1985. File contains indexed biographies of executive member of Kodak Canada from 1988 to 1991. Kodak benefits = Avantages sociaux Kodak / Kodak Canada Inc.
Kodakery Canada / Kodak Canada Inc.
"Published in the interests of the men and women of the Kodak organization." File includes: vol. 1, no. 2 (July 1920) to vol. 12, no. 2/3 (July/Aug. 1931). Some issues missing. Kodak Canada news ; In focus / Kodak Canada Inc.
Kodak Canada news / Kodak Canada Inc. Item is the September 1941 issue. Kodak / Canadian Kodak Co. Ltd. In focus / Kodak Canada Inc.
Canadian Kodakery : a publication for the men and women of Kodak in Canada / Canadian Kodak Co., Ltd.
At Kodak Heights / Canadian Kodak Co.
Business management ; July, 1940.